A place to talk about our Hewescraft Boats. I will possibly be upgrading my bow mount Trolling motor but really am asking myself "Do I really need to upgrade?" 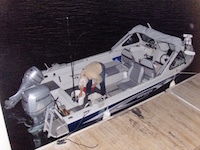 My existing trolling motor I have has been on my last two boats and purchased it around 2002-04, so it is older, but has trolling motor technology and advances really advanced a whole lot over the years? Dunno since I've never really kept an eye on the newer stuff. I have the i-pilot upgrade kit for it and it has a 60" shaft, its also a 12V and still works ok. Is newer really better? I would say there are only two negatives with what you have; it's a 12 volt system and it won't network to your electronics. The first is not an issue since you've had it for quite a few years and not sure if the networking issue is a big deal either. I've had both and think they are both good units, so in my opinion you're not going to gain much by upgrading unless you went with a 24 or 36 volt unit. Being able to plot a course on your lowrance and have a minnkota follow it is nice but there are not a lot of days I don't bother with it, I use the remote and fish. You could spend a whole lot of money on an upgraded Minn Kota and get longer run time going to 24v. The spot lock is really a great option to me. It's like an anchor without the rope. But if you're happy with the current system you have, why spend the money? I went with a 24v Riptide Ulterra for the many times I fish the salt. It's perfect for my Sportsman at 60 inches. Being able to deploy and stow without ever going up to the bow I consider a great safety feature in rough water or ice cold winter day huddled under the canvas. Lunker wrote: You could spend a whole lot of money on an upgraded Minn Kota and get longer run time going to 24v. The spot lock is really a great option to me. It's like an anchor without the rope. But if you're happy with the current system you have, why spend the money? I went with a 24v Riptide Ulterra for the many times I fish the salt. It's perfect for my Sportsman at 60 inches. Being able to deploy and stow without ever going up to the bow I consider a great safety feature in rough water or ice cold winter day huddled under the canvas. I probably for now will leave my current set up alone, for now, but I would really like to go to a 24V system like your Ulterra with the Auto deploy and stow but would have to rethink my battery situation. Do you have pics of your battery placement and set up? My experience with trolling motors until recently was older models such as yours. Okay, but not enough to make me want one on a boat. Then I had the pleasure of riding a boat with a "modern" version and got to run the controls a bit. Couldn't get one of my own fast enough. For me the big deals are the fob controls, anchoring, and short distance movements while at anchor. Flawless. Steer where you want and stop when you want from anywhere in the boat. Anchor to fish a spot, then just "toggle" the motor to advance in any direction 10' at a time to anchor again. That's priceless on windy days when working a weed edge or reef or some such. And a 24v system keeps on ticking all day while whizzing your boat around when you need speed. Lots, lots more carefree fishing without any fiddling. No pictures, but my batteries are in the compartment up front below the walkthrough. I had the old trolling motor with foot pedal in bow on my old boat and barely used it. Now with the remote, spot-lock, auto deploy and stow, setting a waypoint and auto pilot, its a whole new world. Fighting a fish in back by myself or setting down riggers while steering with remote or using auto pilot is unbelievable. I now drive boat to my favorite spot lock point on my chart, grab the remote and hit auto deploy and then spot lock and start fishing! When returning home just plug in the on board charger and your good to go for next trip. Honda tie bar- not the junky Panther one! Thanks for the pics. I have a 160 sportsman on order and was wondering if a 60 bow mounted rip tide Terrova would fit on the bow and if 2 battery’s would fit in the walk thru cubby. Any tip would appreciated. Albe160 wrote: Thanks for the pics. I have a 160 sportsman on order and was wondering if a 60 bow mounted rip tide Terrova would fit on the bow and if 2 battery’s would fit in the walk thru cubby. Any tip would appreciated. Welcome aboard. A lot of Knowledge and help to be found here. Ric's pictures show a very neat setup for a Sportsman. 160-200. 2 Batteries fit nicely.